Villa Kiveli is a traditional Cycladic-style villa with private pool in Paros consisting of two separate buildings and a total of 7 bedrooms, making it an ideal location for families and large groups. Villa Kiveli is a traditional Cycladic-style villa consisting of two separate buildings, making it an ideal location for families and large groups. Villa Kiveli and its guest house is a traditional 7 bedroom property with two units. The main unit holds 4 bedrooms and the connecting villa with a further 3 bedrooms. The villa is situated on a large plot of in the Voutakos area, with only one kilometer’s distance from the peaceful and secluded beach of Voutakos. This south facing beach offers protection from the predominant summer winds. The villa is situated in peaceful surroundings with only a few neighboring residences, offering quiet relaxation and a great sense of privacy with unobstructed views of the Aegean Sea. 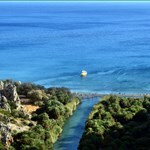 The area of Voutakos is located to the southwest of Paros Island between the fishing village of Alyki and Pounda beach. The location offers beautiful sunsets, views of Paros and the Antiparos. 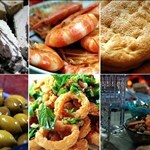 Alyki, the southernmost fishing village of Paros offers a beautiful sandy beach, traditional tavernas and “ouzeris”. Shopping facilities (super market, pharmacy, bakery, green-grocer etc.) is situated only 2.5 km to the south of the property. Pounda beach, which is famous for its excellent kite-surfing can be reached 3.5km to the west of the villa, to that of the Pounda port where frequently scheduled ferries service the small and cosmopolitan island of Antiparos. Parikia, the capital and the main port of Paros is 9 km to the north of the villas. It is one of the most typical Cycladic settlements with the characteristic narrow flagstone paths, numerous ancient churches, white-washed houses with vividly colored doors and windows. Parikia is today one of the most popular and busiest spots on the island with its cafes, tavernas and restaurants offering a wide-range of dining options. Villa Kiveli consists of two separate units. The main villa comfortably accommodates 8 guests in four large bedrooms, all with en-suite bathrooms. The guest villa next door accommodates 7 guests in three large bedrooms, each with private bathrooms. On the ground level the spacious living room and dining room is carefully furnished and decorated, leading into a fully equipped open-plan kitchen which opens up with beautiful French-windows onto a large patio. The patio area offers sea-views towards the west including Antiparos and the evening sunsets. The patio is partially pergola-covered, offering shade and protection from the wind. The outdoor dining table can sit twelve guests and makes it a perfect spot for gatherings for breakfast and dinners. There is a barbeque for the use of the guests and within easy reach to the kitchen. A large private swimming is situated a few steps from the veranda. On the same level but slightly segregated from the living area is a large bedroom with en suite bathroom. The double bed can be arranged as twins upon request. On the upper level you will find the master bedroom with en-suite bathroom, separate office and a balcony and veranda with panoramic views of the surrounding area and the neighboring Cycladic islands. The lower level holds a third large bedroom with en-suite bathroom, where the double bed can also be arranged as twins, a staff room with en-suite bathroom, a guest toilet as well as a utility room. Additionally, the main villa includes an independent studio with a double room with sea-views, bathroom and kitchenette. On the ground level you will find a cozy living and dining area, which opens to a tiled patio and with magnificent views towards the southwest Aegean Sea, Antiparos and the surrounding gardens. 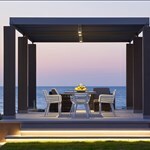 An outdoor dining table is placed under the pergola covered patio, which also has the opportunity to function as seating area for lounging or simply enjoying the ocean views. The fully-equipped kitchen is situated next to the sitting area. The two large bedrooms on the ground floor can comfortably sleep five guests with two bathrooms also placed on the same floor. Both of the ground-floor bedrooms opens up to a patio area with great sea views. The third double bedroom with en-suite bathroom and a utility room can be found on the lower level of the villa.